MONTREAL, Canada — The United States has fortified the border with Mexico since the terrorist attacks of Sept. 11, 2001, in large part in the name of thwarting terrorism. However, some analysts believe there’s a greater potential threat of terrorists entering the U.S. from the northern border with Canada than from across the southern border with Mexico. The Islamic State (ISIS) urges supporters to carry out attacks against Western countries, including Canada, that are in the U.S.-led coalition fighting it. Following that call, two Canadian soldiers were murdered in October 2014. First a soldier was murdered in a deliberate hit-and-run near Montreal. Then days later came a second attack that traumatized Canada. Gunfire erupted inside Canada’s Parliament, the seat of its federal government, after the murder of a soldier outside. A jihadist sympathizer had just killed a soldier at Canada’s War Memorial a few steps away. The shooter then entered Parliament after killing that soldier. Imagine a gunman killing an Honor Guard at the Tomb of the Unknown Soldier and then invading the U.S. Capitol. The suspect was shot dead inside by the Sergeant-at-Arms of the House of Commons, Canada’s lower house, roughly equivalent to the U.S. House of Representatives. The suspect in the hit-and-run led police on a high-speed chase that ended with the suspect’s car rolling over. That was followed by an exchange of gunfire with police, and the suspect was killed. “I was horrified when I saw what happened up there,” said U.S. Customs and Border Protection helicopter pilot Gerhardt Perry. He is stationed in upstate New York after years of flying the southwest border in the Rio Grande Valley of East Texas. “I was in the air. I heard about it over the radio,” Perry recalled. Canada had raised its terror alert a few days before the murder at the War Memorial. “These sort of things, we never would even think would occur in a place like Montreal,” Perry said. “I started saying to myself, ‘this is serious business.’ I’m going to start looking hard here, what could be happening, could somebody be running across, could somebody be trying to escape through the border to get away from that?” Perry said. While the U.S. is hyper-focused on the southern border, there are Canadian cities with known ISIS sympathizers in them. In May, 10 students were arrested before leaving Canada, allegedly to join ISIS. Six other suspected jihadists are missing after leaving for Syria. If a terrorist wants to enter the U.S., some security experts believe it’s far easier to do so here than in the Southwest. There’s heavy tree cover along many parts of the northern border and the Canada border is twice as long as the U.S. border with Mexico. Ground sensors along the U.S. side can trigger cameras of unauthorized crossings. In one photo taken at the border, camouflage-clad, machine gun-carrying suspects move across the border into the U.S. Agents would not disclose the nature of their investigation prompted by the photographs, but the inference is clear — namely that there is activity on the northern border that the United States is concerned about. “I think we overemphasize security on the southern border and we don’t emphasize enough on the northern border,” said Howard Campbell, an anthroplogist and border researcher at the University of Texas at El Paso. His book,”Drug War Zone” focuses on organized crime on the southern border. He’s also studied the Canadian border extensively. “If Homeland Security is really concerned with security, and the biggest security threat is terrorism, we should be more worried about the Canadian border than the Mexican border,” said Cambell. “Because Mexican and Central American migrant workers are not a terrorist threat to the United States,” he concluded. 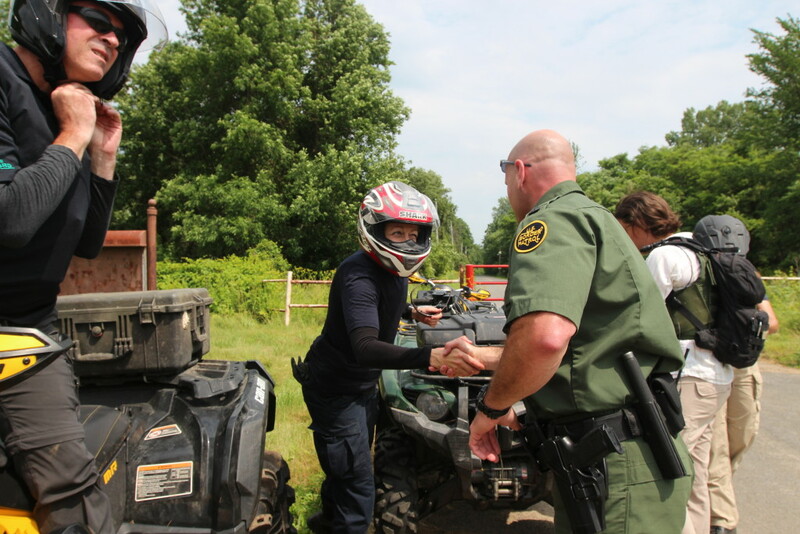 There are approximately 2100 U.S. Border Patrol agents working the 4,000 mile border with Canada. Along the Mexico border, less than half the length of the border with Canada, there are 18,000 agents. In Canada itself, the soldier murders have changed the way people think. “For a lot of people, it’s seen as Canada’s 9-11,” said Philip Oxhorn, Chair of McGill University’s political science department in Montreal. “It brought terrorism to their front door, not their back door. And it made people realize that Canada wasn’t immune, that it wasn’t off on an island unto itself,” he said. Oxhorn explained that the October 2014 murders of the soldiers means that Canada is examining all aspects of security, including border protection, something Oxhorn believes dovetails with the U.S. security policy. “U.S. pressure on Canada to do more to protect border dates back to at least 9-11,” Oxhorn said. “The U.S. always felt that Canada just wasn’t doing what it should do to protect that long border. And so what October means is that maybe Canada will wake up to the fact that it has to take terrorism more seriously, which means they have to do more to protect the borders, which exactly what the U.S. has wanted,” Oxhorn explained. Canada is currently the middle of a federal election campaign. Election Day is Oct. 19 2015. One of the most controversial issues in the campaign is a new law that gives police powers to arrest suspected extremists before any actual act of terror is committed. The law grants wide latitude to police to detain someone they think might commit an act of terror, essentially granting authorities the right to make a warrantless arrest. In a nation that prides itself on multiculturalism and open doors, that move against normally sacrosanct civil liberties is unprecedented. This entry was posted in fronteras desk, fronteras npr stations and tagged cbp, howard campbell, mexico border, us canada border. Bookmark the permalink.